Book summary page | Table of Contents | Purchase page. I met Wamut (Richard Trudgen) when he first came to Arnhem Land. He came from the Balanda (non-Aboriginal) world and I grew up with my people, the Yolngu of Arnhem Land. When I left school I did my apprenticeship as a fitter and turner in the mission workshop at Galiwin’ku on Elcho Island. I continued my education working as a lay pastor to my people at Galiwin’ku when Wamut arrived at Milingimbi. He was also a fitter and turner. Like me, Wamut was more interested in people than just fixing machines and when the opportunity came he changed over to community work so he could spend more time working beside and training Yolngu. He had started to learn our language, history and law, when I left Arnhem Land for my second time to continue my formal education in the Balanda world. In his new role Wamut used the old style of training at first, but it just did not work. No matter how hard he tried, the people did not seem to understand. He would get very frustrated not knowing what was wrong. Despite these frustrations, Wamut’s role of community worker opened up a lot of new ways and opportunities for him to see things from the people’s perspective and to try and understand why the methods used did not work. It gave him a chance to spend a lot of time with the old people and clan leaders on their homelands, or in the community council or just in family groups. At the same time he had to work with many government departments as they were involved in the homeland centre development along with the local community councils and other Yolngu associations and industries. Through all this Wamut started to see that Yolngu were m[rr-dhumbal’yun (confused – mystified) about the Balanda world. This confusion was very deep and is very hard for people who have never experienced it to understand it. You see we have been conquered in many different ways. After the Balanda fought many wars against us and destroyed our ancient trade with the Macassans we ended up on missions just to survive. At this time the Yolngu leaders gave up. They said, “It is no good fighting Balanda because they have some sort of supernatural power. Maybe the only way we can survive is get this power”. So our minds were conquered along with our lands. No matter how hard we fought and applied ourselves the Balanda always won with strange, lawless ways and advanced, powerful technologies. Plus the missions and the Government welfare department used powerful leaders (superintendents) that acted like dictators over other Balanda and us. This left the old people thinking, “Maybe this new way, ‘schooling’, is the path to getting this Balanda power”. So they sent their children to the mission schools in the hope of getting this power from the Balanda. We believed then that if we just went to the Balanda schools and returned home at the end of high school with djorra’ (paper/certificate) then that djorra’ would bring this Balanda luck and power. We thought it was the certificate that would get you a vehicle, make you rich, and give you Balanda power and authority. This authority we thought would be like the power the superintendent had and the power that the Balanda used to push us off our lands. But when the young ones went through that education, it did not work. They got the certificate but they did not seem to work. No, on top of that they were more confused about the Balanda world than before. Many were so confused they started drinking or just dropped out. Others went mad trying to understand the strange mysteries of the Balanda world. Wamut saw this confusion and how it led to a lot of conflict between Balanda and Yolngu when they did not really understand each other. Yet at the same time he saw that when Yolngu worked within our own law, knowledge and social structure things worked very well. We learnt quickly and the people were very productive. As Wamut listened to the clan elders, training Yolngu for all sorts of jobs and positions and helping others return to their Homelands, he saw that basic elements were missing in many of the programs set up to educate and help the people. The same things were missing from both the mission and welfare approach of the past and also from the government approach that started in the seventies. He saw their programs were not fitting into where the people were at, so the people were not really learning and the confusion increased. This became a turning point in his life as he started challenging the mission and the government authorities, pointing out to them where they were failing to meet the real needs of the people. What he said seemed strange to many Balanda and even to some of us Mission-educated Yolngu because we did not see our own confusion. We had come to believe, even though we could speak English well, that the Balanda world really did have some strange supernatural power and did not operate on tangible things that we could really understand. Only the old men Wamut worked with understood him. Many Balanda considered that he was bawa’mirr (mad). They would attack him saying, “I don’t think you are right, you are not understanding it properly. There must be something wrong with you”. Others said, “I’ve known Yolngu for a long time and I have never heard them say they are confused or don’t understand the Balanda world”. From all the pressure Wamut became very sick and left Arnhem Land after 11 years. It was in the late eighties that I met Wamut again and we started to talk about many of the issues raised in this book. This was also a very hard time for me, because the programs and methodologies being used were not working. It was a time when I was looking at my own approach. “What was the best way to do education and what programs could really help Yolngu people experience real dignity and pride as a group of people? How could we stand as equals instead of always agreeing, in almost a begging way, to anything that Balanda said to us because we were so confused and in awe of them?” Of course this feeling within us would sometimes burst out and we would become very angry because we believed we were human and capable of knowing, too. I was tired of the confusion and confrontation, always fighting, fighting, fighting. There seemed to be no way to solve it. I remember talking to my father about it. He would say, “There is another way. In the old way of our people, our elders would sit down and talk through and analyse problems together, even if it took a long time. This way we would find ways of solving problems together.” So I started looking for that way of doing things. As I was saying, Wamut and I started talking about how to meet the needs of the Yolngu in Arnhem Land. Was there a way where Balanda and Yolngu could really solve the problems we faced together, through a m[gaya dhukarr (peaceful way/path)? This partnership between Wamut and me was not an easy one for us to develop. In the early 1980’s I used to hear some of the things that Wamut was talking about and like the others who were criticising him, I too thought that he was bawa’mirr (crazy). Now I knew that he was not, what he was saying was right. So I invited him to come and work with me. When Wamut returned to ARDS (Aboriginal Resource and Development Services Inc.) he started practising this different methodology of education within ARDS itself, on our leaders and on me. This education aimed at overcoming the confusion excited me and I called it ‘discovery education’ because we could discover the answers we wanted to the problems that faced us, in a way that made good sense to us. This education was in our language, and it was built on how we saw things from within our own cultural framework rather than Balanda telling us in a foreign language, and way, what they thought we should know. Through this education I started to see that we could really understand the Balanda world in the same way we understood our Yolngu world. From Wamut’s influence and the dialogue that occurred, ARDS moved away from political confrontation into education through dialogue. We started concentrating on finding ways to educate and train Yolngu so that they could really understand this strange world of the Balanda and participate as equals. That is why I asked Wamut to write this book. Many books and papers have been written about the Yolngu of Arnhem Land. This one is very different. It is written out of the pain experienced by living with the suffering that is everyday life for Yolngu. But Wamut has not stopped there. 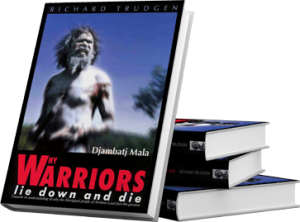 Out of this pain has grown something very valuable in the form of new understandings and a new way for Yolngu to learn about the foreign Balanda world. I wanted Wamut to speak to Balanda about the real situation that we face in our lives every day, a reality that is hard for people of another culture to imagine. I wanted him to show Balanda the important role they have in helping Yolngu break through the confusion we have in front of us. In doing it, Wamut has used many stories told by the people over the years. He has used health and education as main themes to talk about how the communication breaks down, and why government programs fail. He then brought together what others have found across the world to show this is not really a Yolngu or Aboriginal problem, but a problem that exists when cultures and languages collide. Then he shares some insight about the way forward. So I invite you to read this book. In that way we can walk together for a while and discover a more common path to solve the problems we face. Executive Officer of Aboriginal Resource and Development Services Inc. Member of the Council for Aboriginal Reconciliation.